Since the turn of the century, sailors in the Sutton Creek area had made various attempts to establish a club, and around 1930 an liaison was formed with Howth Sailing club, with meetings and social events taking place in the Howth club premises, and actual dinghy sailing taking place in Sutton Creek. As the yachtsmen in Howth and Dun Laoghaire turned their attention more towards the larger keelboats, local dinghy enthusiasts took the opportunity to 'go it alone'. Early in May 1940, Sutton Dinghy Club was launched, adding to the growing list of East Coast sailing clubs. For the first ten years of its existence, the members used a small boathouse loaned by Desmond Keatinge, the first Captain (the club could not afford a Commodore at that time!). With Desmond at the helm, the committee got down to the task of introducing a fleet of boats to convince well wishers that the club was really alive, and seven International 12 ft. Dinghies sailed their first race under the new club burgee, which was (and still is) blue with a white silhouette of the International 12ft dinghy. The 'Twelves' no longer race here (but one member has just brought one back this year! ), and the burgee is a reminder of those early days. The official opening of the new clubhouse took place on June 1st, 1951, by Douglas Heard, the then President of the Irish Dinghy Racing Association (later the Irish Yachting Association, now the Irish Sailing Association). The boat park (or 'Hardspace') could originally only accommodate six dinghies, but was increased to between thirty and forty over the following years. In 1967 the hardspace was increased to its present size, and the clubhouse was extended in 1980 to provide the function room and better changing facilities, which were further developed again during 1986, to improve the quality of life ashore! The boats on the hard are also changing: the International 'Twelves' were soon joined by the IDRA14s, then Hornets, Enterprises, Fireballs, Mirrors, GP14s, Optimists and Lasers, among others, became part of the ever-evolving scene at Sutton Dinghy Club. The membership also evolved- Sutton sailors were family men and women, and their children inevitably took to the waters. 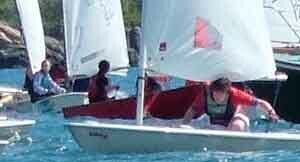 Over the years, Junior sailing and Junior training became more and more an important aspect of the Club activities. At the same time, sailors everywhere sought to improve the enjoyment of their sport by providing a safer environment, particularly for novices: rescue boats and equipment were bought and put into service in every Club. The Sutton Dinghy Club fleet now consists of three boats: a 16-foot Workboat and two Sea Rider 14-foot semi-rigid inflatable rescue launches. 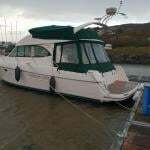 The agreement provided an ongoing series of Adult Sailing Courses, and Junior introductory courses, throughout the sailing season, which attracted many graduates to take up Club membership. 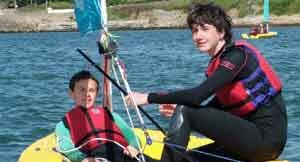 In addition, the full ISA Junior Training programme was provided for Sutton Dinghy Club junior members, using the Club rescue boats in addition to the INSS boat. This initial venture with the INSS was so successful that the Club decided to continue the concept, but under the full control of its membership, and in conjunction with a FAS-sponsored Community Employment Project. As the Club activities expanded, and membership numbers expanded beyond the existing capacity for boat parking, discussion among members centred around the need for a long-term plan for the club in order to ensure its survival and viability beyond the millennium. The latest development provides an additional 750 sq metres of parking for boats and cars, to cater for the existing membership numbers. Some things don't change: every year, in conjunction with the Royal Cork Yacht Club, there are inter-club team races for both junior and senior sailors on a 'home and away' basis. For each winning team, there is a most unique prize – they get to keep custody for twelve months of the 'Book', which is a written account, added to year by year, of each race and the teams involved. This sixty-year-old saga (apart from a few gaps here and there when weather or illness intervened) of friendly rivalry between these two Clubs includes many sailors who went on to become internationally-renowned names in the sailing world – read this Book to understand where Harold Cudmore learned his tactical skills – by bitter experience when racing against the Sutton sailors! 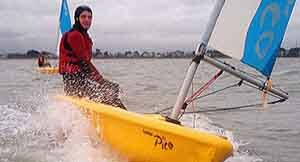 Sailing from Sutton Dinghy Club has improved significantly since 2007. The new boat park extension provides easy access to over 100 boat spaces. This is a wonderful resource, and it is marvellous to see new and restored boats joining the Senior fleets. Junior level sailors are eager to attend club racing and improve their skills. Our summer courses continue to thrive under the ever enthusiastic stewardship of Hugh Gill. The combination of fun, learning and activity, often at a frenetic pace, is inspiring to see. I, on behalf of the members, extend grateful thanks to both the staff in the club and the 'beach parents' who facilitate these wonderful courses each year. We look forward to the continued challenge of increasing the number of active sailors on the water, providing training in sailing, power boat handling and race management, allowing us to enjoy our fantastic sailing environment at Sutton Creek. The various committees are busy throughout the year ensuring that we all enjoy our club whether afloat or ashore. They deserve our thanks and on your behalf I do so gladly. 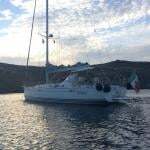 Between the sailing and social events there is something for everyone to enjoy. To quote that great authority on all things boating: "There is nothing", said the Water Rat (in The Wind in the Willows), "absolutely nothing, half so much worth doing as simply messing about in boats... in boats – or with boats... in or out of 'em, it doesn't matter!"